Bagua application, Yaos, combine-10 theory (or married couple magic numbers), Yin sets and Yang rises, later years Bagua direction, four main directions and corners, twelve news Guas, natural Gua arrangement and the universal round table is co-related, without depth and breath in understanding the rational, one cannot execute the application to our advantage. 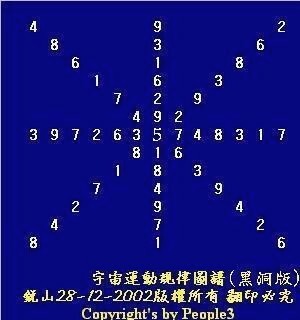 Lok Shu magic square with 9 on top and 1 at rear, left side with number 3 and right 7, 2 and 4 both are shoulders and 6 and 8 set as foot. The early days Bagua set as the form while the numbers are the application. Jin Shi mentioned ‘Kin, Tui, Lei Chan, Shun, Ham, Kan, Kwan, mutually colliding each other, while Yin and Yang energies igniting and causing changes to take place.’ Also, it is mentioned that ‘with such changes take place between 5-elements and Bagua, the energies have transformed into kind or unkind energies. The formation of Bagua with six Yaos, Heaven and Earth with Yin and Yang interaction will dictate your life path; the Kin and Kwan lead the backbone of Bagua where the existence of all matters and the universal originated. The Jin fang universal round table is utilizing and evolving the ‘body’ and ‘application’ concept. The round table gyrate with 7 and 9 numbers in the middle, or in simplicity the Lok Shu 49 metal and 16 water move clockwise on the left in 6 multiple, 27 fire, 38 wood move anticlockwise on the right. 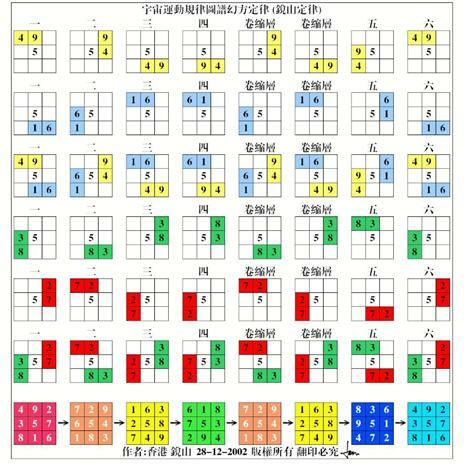 The Lok Shu magic numbers mutually colliding, exchanging, and crossing and as a result the formation of 8 Guas and 384 Yaos are derived. Kin and Kwan are set with South and North, Lei and Ham with East and West, while Chan, Shun, Tui and Kan as four corners. Left side of the diagram from Yi 益Gua to Kin 乾Gua with total of 32 Guas, Yi益, Dun遯, Ye頤, Fu復, Wu Mong無妄, Xue隨, Shi Ke噬嗑, Chan震, Ji Ji既濟, Jia Ren家人, Meng Yi明夷, Pen賁, Ke革, Tong Ren同人,Feng豐, Lei離, Suen損, Lin臨, Chong Fu中孚, Jie節, Kui睽, Gui Mei歸妹, Li履, Dui兌, Tai泰, Da Chu大畜, Xu需, Xiao Chu小畜, Da Zhuang大壯, Da Yu大有, Jua夬, Kin乾 with total of 112 Yang Yaos, with 80 Yin Yaos and extra 32 Yang Yaos. Jin Fang mentioned that ‘Yang from Rat while Yin from Horse, both diverging to left and right. Rat moves left while Horse moves right, as a result of such movements and changes, the kind and unkind energies are created. Right side of the diagram from Hang恆Gua to Kwan Gua with total of 32 Gua, diagonally opposite with the left side of the table, Hang恆, Teng鼎, Da Guo大過, Kou姤, Sen升, Ku蠱, Jiang井, Shun巽, Wei Ji未濟, Jia解, Chon訟, Kun困, Meng蒙, She師, Huan渙, Xian咸, Tun屯, Xiao Gua小過, Lu旅, Jian蹇, Jian漸, Qian謙, Kan艮, Pei否, Shui萃, Chin晉, Yee豫, Koon觀, Pei比, Mok剝, Kwan坤, with 112 Yin Yaos, 80 Yang Yaos and extra 32 yin Yao. To sum up both sides we have sum up the total of Yaos. Chan Palace with24 Yin and 24 Yang Yaos, Lei Palace with 28 Yang and 20 Yin Yaos, Tui Palace with 28 Yang and 20 Yin Yaos, Kin palace with 36 Yang and 12 Yin Yaos. Left side with Kin commands the most Yang Yaos. Shun Palace with 28 Yang and 20 Yin Yaos. Ham Palace with 20 Yang and 28 Yin Yaos, Kan Palace with 20 Yang and 28 Yin Yaos, Kwan palace command the right side of the round table with the most Yin Yaos of 36 and only 12 yang Yaos. Matters in the universal are made up of both Yin and Yang energies with diverting the Yin while embracing the Yang energies to achieve the harmonies state. Bagua interact diagonally and colliding with each other, If you observe carefully the Jin Fang round table, the first Gua on left side of the round table is Yi Gua益卦, while the first Gua on the right table is Hang Gua, this is a pair of diagonal combine-10 effect. Dun Gua屯卦is diagonal with Tang鼎, while Yi Gua頤卦 is diagonal with Da Gua, Fu Gua復卦 is diagonal with Kua姤卦, Wu Ming無妄 is diagonal with Sen., Shui隨is diagonal with Ku蠱, Ser Key噬嗑is diagonal with Jian Gua井卦, Chan 震 is diagonal with Shun巽, Jig 既濟 is diagonal with Wei Jig未濟, Jian Ran家人 is diagonal with Jian解, Ming Yi明夷is diagonal with Cohn訟, Key Gua革 is diagonal with Ming蒙, Tong Ran同人 is diagonal with Ser師, Feng Gua 豐is diagonal with Human渙, Lei Gua離錯is diagonal with Ham坎, Shin 損 is diagonal with Xuan咸,Lin臨 is diagonal with Dun屯, Ching Fu中孚 is diagonal with Xia Gua小過, Jive節 is diagonal with Lu旅, Kua睽 is diagonal with Jian蹇, Kua Me歸妹 is diagonal with Jian漸, Li履 is diagonal with Ian謙, Tui兌 is diagonal with Kan艮,Tai 泰is diagonal with Pie否, Da Chu大畜 is diagonal with Suit萃, Xuan需 is diagonal with Chin晉, Xia Chu小畜is diagonal with Ye豫, Da Change大壯 is diagonal with Kong觀, Da Yu大有is diagonal with Mock剝, Kin 乾 is diagonal with Kwan坤, exactly 32 diagonally opposing each other to become the 64 Guas, This is the combine-10 theory that include both Yin and Yang theories and mutually create each other. Che Xia Fu says “Thunder is dynamic while wind disperse, all matters begin with Yi益”, there is a saying that Meng Xi has the same feeling on this issue. Jing Shi mentioned: The Yang begins from Rat, in the middle of Yi Gua益卦, Horse is in the middle Hang Gua恆卦” The round diagram started from the middle from Feng Rui Yi Gua as Rat with Yang energy emerges while the Horse begins in the Rui Feng Han as Yin energy that subside. Virtue begins at the east and east is the Thunder Gua that will serve to ignite or alert the world about what is happening around. Just last night Hong Kong experienced a thunderstorm and today the weather temperature has dropped approximately ten degrees and I am wondering will Northern part of China experience a snowstorm in coming winter? The day before a Chili morning Hong Kong will normally experience thunderstorm. A cool day represents Yin energy. Han Gua diagonal Gua is Yin Gua and indeed this is preciously the natural phenomenon on earth. Yi Book: Hard and soft mutually creates friction, Moon and Sun mutually orbiting, day and night” Universal created heaven and earth which resulted in rain, thunder, wind and etc. The airflow created turbulences that resulted thunderstorm and electric, such chemical reactions resulted in rain and so on. This serves as a platform for living beings. That is why Jing Shi is using Yi Gua as the Lead Gua. Yin and Yang keep exchanging until the state of equilibrium is reached. What ever goes up must come down and what ever hit the bottom will bounce back. Shun Gua is in the middle and Kin set as Hang Gua. Jing Fang round diagram Lok Shu numbers is unique that diverge to two paths, the one with clockwise four spots and the second anticlockwise four spots. That spiral would end up with 64 Guas. Jing Shi says ‘Kin and Kwan is the same period’ The Lok Shu nine palaces begin to move from Rat’s half Yin Gua clockwise to end up in Kwan Gua. This is representing the Yin and Yang energies mutually set and rise in a systematic manner. Both left and right sides contributing 32 Yaos respectively. 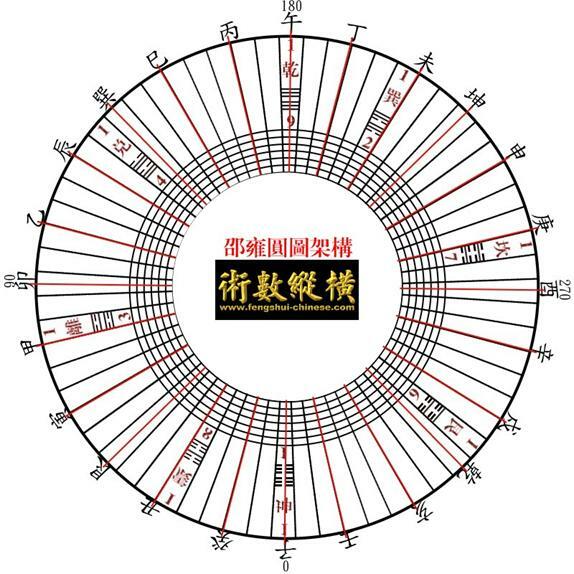 From the inner layer of round daigram of the Heaven Gua, Pei is nine, with the frame of though that the Early Bagua as body while the Later Days Bagua is the application in which the 9 is still Kin Gua. The diagonal effect telling is the while Pei is 9 the diagonal should be 1 with Tai, that’s Kwan Gua. Let us examine another example the Gi Ji 7 is Ham the diagonal Wei Ji 3 is Lei, Shuan Gua is 6 as Kan Gua diagonal as 4 Xian Tui Gua. The diagonal effect of Kin/Kwan, Kan/Tui, Chan/Shun,Lei/Ham are all in Yin and Yang patterns. If you observe the inner layer of Kin Gua and flip over on the South, you can see the early days Bagua direction as Northwest. From observing the Jing Shi Round Table of Kin Gua, begin with Hen Gua(恆卦)move clockwise8 steps to Shun, with another 8 steps to Ham Gua, 8 more steps to Kan Gua , with 8 more steps to Kwan Gua, the right half of the round table with Four major Guas that govern 45 degrees. From Lei Gua to Tui Gua is 8 steps and 我們從京氏圓圖乾卦後一卦,即恆卦開始,順旋而數八卦到巽,再數八卦至坎卦,再順旋數至艮卦,為八卦,再由艮卦數至坤卦為八卦,右半圈四卦剛好在四十五度角上,那我們又從左半圈益卦,順旋數至震卦,為八卦.震卦順數數至離卦亦是八卦,再由離卦數至兌卦,剛好八卦,再由兌卦數回乾卦,剛好八卦,各八卦大家剛好在四十五度角上,各施其職,各所管轄,而它們八卦合共一圓周三百六十度,而我們從子位子位至卯位,再從卯位至午位,由午位至酉位,酉位又回至子位四正剛好是四方形.再看我們四維卦,又是一四方形.乾鑿度曰:”八卦之氣終,則四正四維之分明,生長收藏之道備,陰陽之體定,神明之德通,而萬物各以其類成矣”.又曰:”四正四維皆合於十五,四正四維即八節風,即每節四十五度. Jing Shi Yi Chuan, Kin Gua located at Northwest pivotal point, the Yin and Yang diagonal point; Kwan Gua is pure Yin in nature located at the Southwest location, Shun at the Southeast, Kan Gua is located at the Northeast, Chan in the East, Tui is the West, Ham is North and Lei is the South. This is the exact locale of four main and four corners Guas. Looking at the traditional Bagua, the Kin Gua leads three males Guas while the Kwan Gua leads three female Guas and this obviously neglected the existence of Four main and Four corners Guas. Current new Guas arrangement should be Kin Shun Kan Kwan Chan Tui Jam Lei. With start from Kin, follow by Shun through Kan and strive at Kwan, with Kin ended up with Lei. Kin Palace first move will lead to shun and become Tin Feng Guo Gua, it then move again to become Tin San Tun, then Tin De Pei and so on…the four corners Guas appear! Kin (Northwest), Shun (Southeast) Kan (Northeast) Kwan (Southwest). With the start from Kwan while Chan emerges, Tui through and Kin strives with Kwan ended up with Ham. Kwan palace first move to Chan become De Lui Fuk, second move become De Chak Lam, third move to De Tin Tai and so on. With the Kin as the ultimate beginning of universe while the Kwan is the end of the tier end with Ham Lei Chan Tui as four main directions. The importance of the round table is expressing the message of Yin subsides and Yang on the rise, the 12 news Guas mimic the same message, we can see that the left half round table 6 Guas of Fu復, Lin臨, Tai泰, Da Chuang大壯, Kui夬, Kin乾, and the next 6 Guas on the right half round table are Kuo姤, Dun屯, Pei否, Koon觀, Mok剝, and Kwan坤 are combined as 12 is the essence of Jing Fang ideology to use the number 6 as core or base. The Jing Fang 6 Sons Guas energies are again using the number 6 as catalyst. Changes are the core message that one can find here. 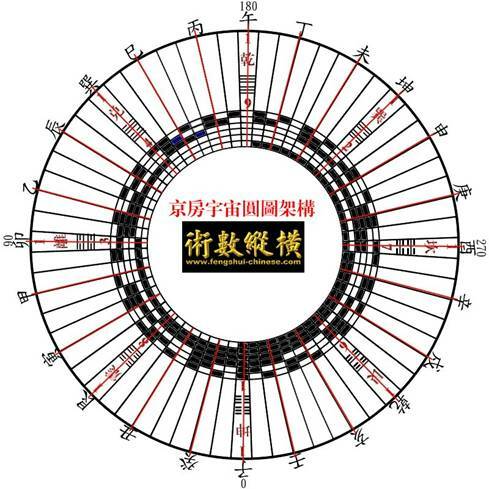 In the Chun Chiu era, Jing Fang also changed the 12 tones to 60 tones (musical temperament) using the gyrate theory. 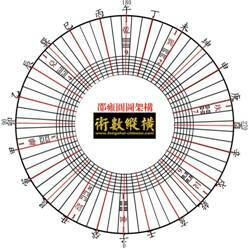 The Lok Shu numbers divided into two paths and gyrate six times to make up a total of 64 Guas. The two paths that mutually gyrate and result in with Kwan creates 6 Guas and Kin Gua creates 6 Guas as well that add up to become 12 Guas. And these 12 News Guas are the phenomena of Yin Subsides and Yang dictates and vice versa and the circle begins all over again. This is the Jing Fang round table imperative message. The 12 news Guas resulted from the Lok Shu numbers gyrating are the mainstream identical to human body 12 main bloodstreams. That will dictate the whole body’s function. During the gyration period, Kin will not use Ham and Kwan will not Lei and that is in line with the natural course of Mother Nature. The accuracy of the sequential and arrangement of round table 64 Guas is symmetrical to human body whereby the 3 Yin and 3 Yang bloodstreams (blood pressure point according to Chinese medicine) that is why we cannot go wrong no this one. Horse spot is where the right Sun located, rat spot is where the right moon is located, Rabbit spot is where the left sun is located, and Rooster spot is where the right moon is located. For instant, if Lei Gua is at Tiger spot and not Rabbit spot, this defies the natural course and that ought to be human error, since that becomes a left Shao Yang (少陽). To site another example, if Ham Gua is not at Rooster Spot but at Monkey spot, that became left Shao Yin with substantial differences. In the 12 artilleries blood stream cycle round table, Rabbit spot is the leading Shao Yang San Jiao Ching (少陽三焦經), (Chinese medical term for body functional parts related to heart/lung/etc), Rooster is the spot of foot solar spleen circle (足太陽脾經) (term for foot arteries that effect our spleen), a margin error for such Guas should be minimal of insignificant but a deviation of a Gua is a catastrophe in diagnosing a sick patient. In Jing Fang round table Kin Gua moves 8 spots anticlockwise to Tui Gua, and from Tui spot we move 8 additional spots to Lei Gua, and again 8 more spots we arrived at the Chan Gua. Now let is begin again from Kin Gua and this time we move 8 spots clockwise and arrived at the Shun Gua, another 8 spots will be us to the Ham Gua, move clockwise again 8 spots is Kan Gua and last 8 will bring us to Kwan Gua. 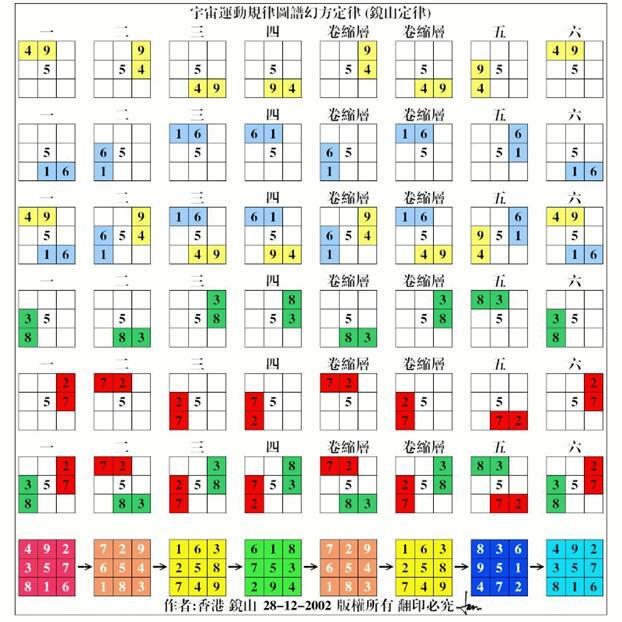 8 Palaces and 8 Guas resulted in 64 Guas, with Kin Kwan, Ham, Lei as 4 main Guas on Rat Horse Rabbit Rooster spots while Chan, Shun, Tui, Kan are the 4 corners. This Chinese wisdom is inline with natural courses. Zhou-I Chan Tong Qi is the Taoist utmost respected scripture and treated as the bible of Tao, is the base for Taoist practitioners to learn and practise the knowledge of martial arts, to learn the art of longetivity and metaphysics that influence the world. The two famous backbones Thesis are the Lunar Stem Adoptions Theory and 12 Pi Guas. The third popular theory is Heaven ad Earth, Water and Fire 4 main Guas. The Stem adoption theory belongs to Jing Fang. According to Jing Fang: The division of Heaven and Earth with Kin and Kwan Guas that adopt Kap Yuet Yam Kwai, Chan adopts Kang and Shun adopts San, Ham adopts Mou and Lei adopts Kei, Kan adopts Peng and Tui adopts Ding. Chan Tong Qi scripture has managed to include two of Jing Fang Theories, beside the Stem Adoption Theory, Jin Fang's 22 news Guas also included into the scripture. Says Jing Fang, the changes in Six Yaos in 12 news Guas resulted in the multiple of 6 with Kin and Kwan as base for transition. The spirit of Jing Fang is none other than the number 6,just like the Lok Shu magic numbers that use 6 paths to derive the 64 Guas. Chan Tong Qi only preserves limited of Jing Fang knowledge, the other 8 big works of Jing Fang were lost in history, nevertheless the bit and pieces of the works can be traced or detected. Tang era of Wah San School Chen Xi Er has biggest influence on Song era metaphysic even until today. Nan Huai Jin acknowledged, “ Chen Xi Er’s knowledge is inherited from even before the Han era of Dan Dao School which also attributed from Chan Tong Qi. His descriptions of Lok Shu and Tao Chi Diagrams had passed to Shao Kang Ji, and Zou Dun Yi who later became legend. The author of Chan Tong Qi is Wei Pai Yang, is highly preached and the title of ‘The real dragon man’ was given to him and the famous Chen Xi Er also being recognised in this regards. From historical perspective and analysis of many scholars, the book Chan Tong Qi plagiarised not only the Stem adoption Theory but the 12 News Guas as well of Jing Fang. No one mentioned Jing Fang findings in the Song era even during that time The Taoist had different schools or sects. This is unfair and unjust to Jing Fang. 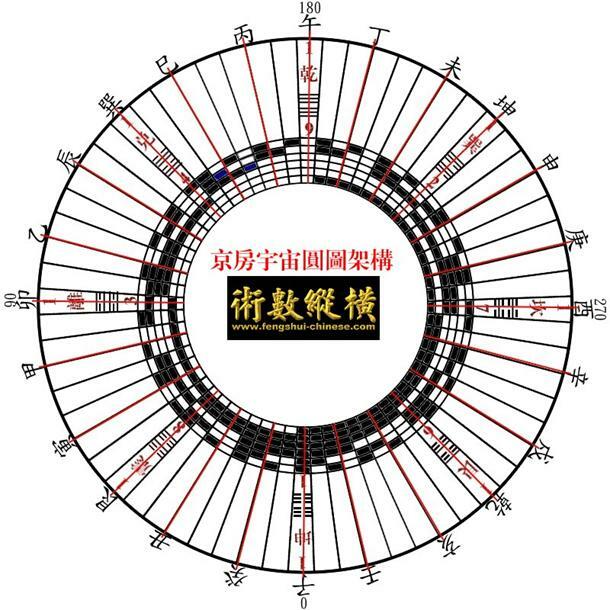 The explanation by Shao Kang Ji of his round diagram: The Rat in Winter Solstice is with extreme Yin energies, while the Rabbit in the Spring Equinox is with extreme Yang energies. Horse in the summer solstice is with extreme Yang as well, while the extreme Yin also can be found on Autumn Equinox. The middle path of 360 is 180, such routes is divided equally. Quote “Ham and Lei with extreme Yang and Yin energies, in which Tiger is leading the Lei Gua and Monkey leading the Ham Gua, no matter how the extreme goes the middle path still remain the limit to avoid cross-over. Kin and Kwan on top and bottom, with Lei and Ham on left and right, that signifying the sky and earth and the sun and moon on the sides. Manipulating the four seasonal points of spring, summer autumn and winter to dictate the daylights duration. Let us examine his sequence of Pu Xi Bagua round table of Kin Tui Lei Chan Shun Ham Kan Kwan that did not match his statement that Tiger leads Lei, Monkey leads Ham, which is Kap leads Lei and Kang leads Ham! !